One successful way of finding new Oriflame Consultants is by having an Oriflame Recruiting event in town. 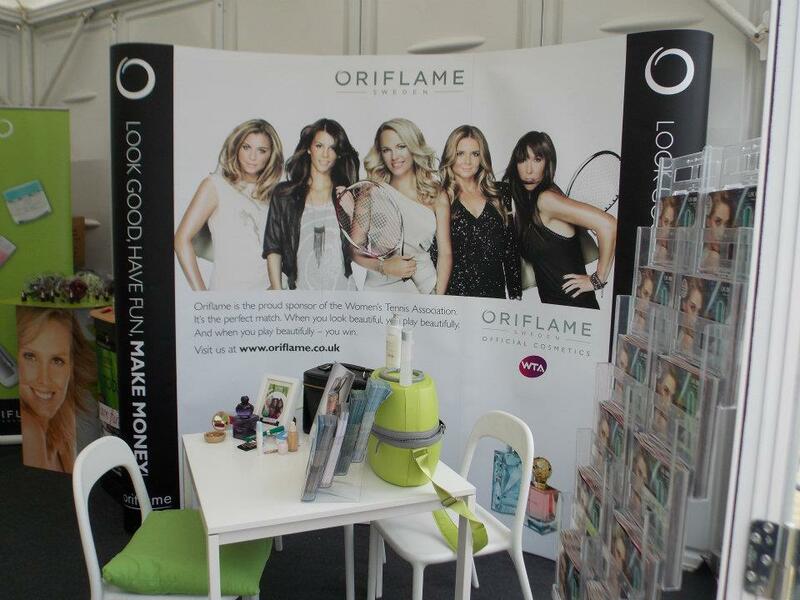 The picture is one of our Oriflame Recruiting stand . We talk to people and give away free samples and our recruiting leaflets to people who are interested in earning extra cash. For anyone who is really keen on getting started with Oriflame, we are able to book an appointment to get them going later that day or over the next few days. It usually takes between 30-45 minutes to get started at Oriflame. We supply new starters with a starter kit and brochures and give them practical tips and advice on how to get off to a fantastic start with Oriflame and gather orders. Having an Oriflame Recruiting stall is great because you have the opportunity to chat to people. You can also pick up Oriflame Customers who may not have a current Oriflame Consultant to serve them. Dress for success – make sure you look professional and you are using/wearing Oriflame products. Personally I like to wear black trouser suite . I also have some logo’d t-shirts as well. Whatever you wear, look smart and professional. Make sure that you have plenty of flyers or prospecting cards with your name and number on them. You never know whether someone takes a flyer and then re-discovers it in their handbag a few weeks later. Get yourself a small A6 booklet where you can keep names and numbers and you can book people in to get started. Don’t take a “no” personally. You never know whether someone might just need a bit of time to have a think about things. Just smile and be friendly. If you are going to do an event or be in a specific place, why not advertise where you will be on social media. I find this works really well if I advertise where I am going to be, as quite often people want to speak to someone face-to-face before getting started. Where can I go to do Oriflame recruiting? Why not find out what is going on locally. If you are new to doing Oriflame Mangers program , why not buddy up with your upline Manager, Your Upline Leader or even other local Consultants. I personally enjoy working with other people, especially if they are in my team too. Most of all your Oriflame Recruiting should be fun.